Is anyone still selling 6888 tubes? I have a Miller 42-A antenna coil. Will that work in this transmitter? I have some 6X5 rectifiers but no power transformer, so I’m planning to buy a Hammond 261G6, which has 250V CT plus a filament supply. My local parts/surplus store has some 9-80-120 transformers for the Music Man 1600B guitar amp at a good price,but they are 67V CT, which I’m guessing is too low. It should work using the winding intended for the 365 pF cap. That would be somewhere around 200-250 uH. Bill Hamre did supply 6888 but he's no doubt wintering in the Bahamas. As far as power transformer, is that 67v from tap to each leg or 67v across both legs?? If so a voltage doubler would no doubt work, I used one in the 12SC6 xmit. Transformer for it had 36 & 24v windings that were connected series, then applied to a doubler. Using 1N4007 rectifiers, that 60v produced approx 160v B+. All that's needed for doubler is one additional rectifier and filter cap. 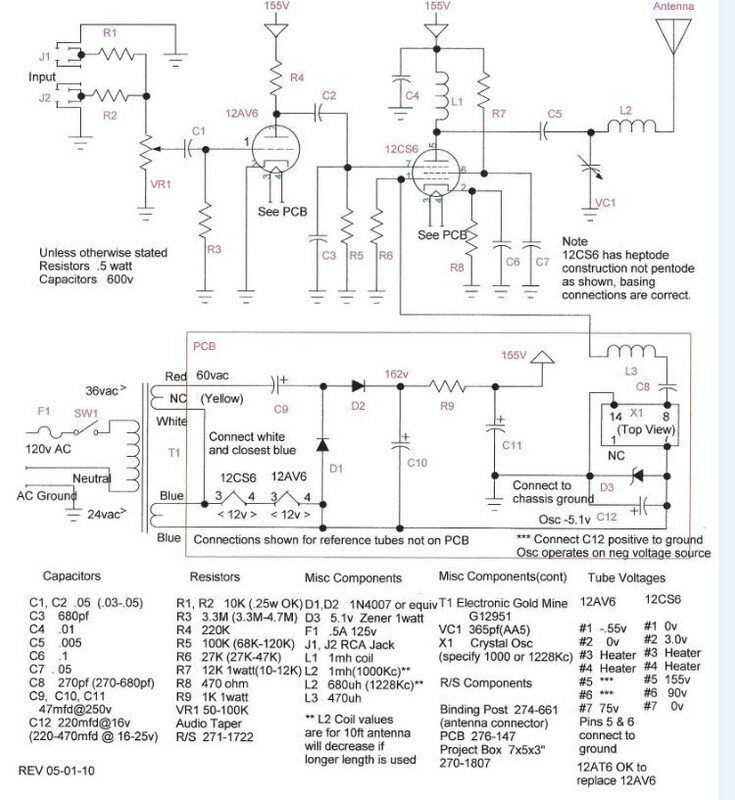 On your schematic, I’m assuming C9 and D1 are the extra diode and capacitor? Yes C9 & D1 are added for the doubler. D1 & C10 would normally be connected to ground but I needed a power source for crystal osc, so used the ground end for the 5v supply. How are you planning on lighting the toob? That transformer has no 6.3 v output. Well, the good news is that I found a 12.6V center tapped filament transformer hiding away in a junk box I had long forgotten. The bad news is that I never bought that 67V power transformer and now it’s gone. If you can come up with a 25v transformer could use that with a tripler, supplies around 105v. A 35v xformer & tripler would be over 140v. I can send you a 6888 tube first week in march. Just PM me with a mailing address. I found a dual primary/dual secondary transformer in my junque box. Thordarson PFC 324 24VA. secondary 5/10V. Maybe use one primary winding for B+ and have two 5V secondaries. If this will work it's yours for shipping. Doug, that sounds great! PM sent. Exciting that this project is coming together! Just a word of warning. When you use one of the dual primaries as a secondary, it drops the VA rating in half. So, the transformer is now 12 VA instead of the original 24. The 800 mA heater will take another 5 VA, leaving you with 7 VA for the plate supply. This should still be fine for this transmitter, as long as it's just the single 6888 tube and no tube preamp stage. I got the transformer (thanks Doug!) and it looks like it was in the wrong box. The Thordarson PFC324 is actually dual primary/dual secondary 12VA, secondary 60/120V. So, it sounds like it will be perfect for a B+ supply for this transmitter. I'll use this along with my 12.6VCT filament transformer to power the tube. Assuming ripple is small and the load current is constant, they say that ripple voltage = load current / (fC). For 120V RMS, peak voltage is 120*sqrt(2) = 170V. My local parts store has 200V electrolytics up to 1000uF, or they have a 330uF at 400V, which I'm guessing would be safer. Putting this into the calculation for ripple voltage gives 0.02A / (60*0.00033) = 1V, which seems reasonable. Norm's schematic calls for 120V, but I've seen people use higher b+ voltages in other discussions about this transmitter. So, my last question is whether or not I should use a resistor in the filter to lower the voltage (which I guess would also reduce the ripple?). A series resistor to drop 50V at 20mA would be 2.5K ohm and would dissipate 1W, but it sounds like I might not even need this since the 6888 can handle plate voltages up to 250V and the average plate voltage is listed as 150V. Although, I hear people say you should always use a series resistor with a silicon diode as protection in case the diode shorts out. Personally, I'd use a bridge rectifier. Less ripple, and no DC through the transformer secondary which they don't like unless they're specifically designed for it. With a bridge rectifier and suitable filtering, your B+ should be around 160 Volts which is a good voltage for these transmitters.